Instead of £9,016.00. You save £450.80 due to the online discount . 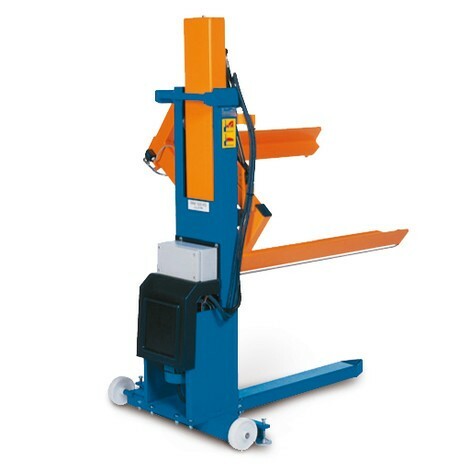 The electro-hydraulic forks of this pallet lifter allow goods to be lifted to an ergonomic working height and tilted on both sides by up to 40°. Integrated dead man function and overload protection function ensure safe work flows. 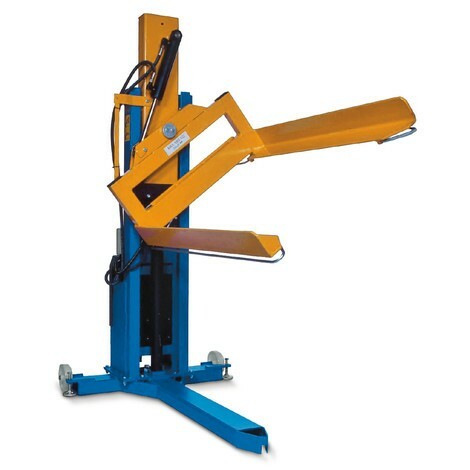 The EdmoLift® pallet lifter with swivelling forks is especially suitable for use on production lines or in shipping departments. The T-shaped base frame offers good accessibility from 3 sides for easy loading and unloading. The forks can be swivelled to the left or right by 40° using the infinitely adjustable tilt function. This avoids stretching movements, while at the same time providing a good overview of the contents of the load unit. Electro-hydraulic safety valves, overload protection and a deadman function ensure safe work flows. In addition, there are two safety frames below the fork sides, which prevent the lowering movement during compression. The EdmoLift® pallet lifter, including 3 m connection cable and CEE plug, is supplied for immediate commissioning. Order the EdmoLift® electro-hydraulic pallet lifter with tilt function here in the shop.